UKIP officials have been accused of being "shambolic" by changing their minds over who should represent the party in a parliamentary seat. Clayton-based councillor Jeff Bray was picked for the seat last week over national executive committee member Paul Oakley by three votes. However, the party's ruling committee has now announced London-based Mr Oakley will be its candidate. 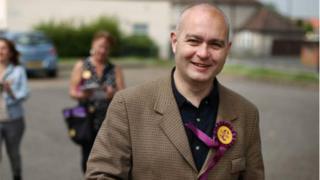 Mr Bray told the Clacton Gazette he was "very angry" about the decision. In emails seen by BBC Essex politics reporter Simon Dedman, one party activist said: "Shambolic doesn't even begin to describe HQ's handling of this". Image caption One UKIP activist said the decision to overturn Jeff Bray's candidacy was "shambolic"
Another added: "My faith in HQ has gone". Former party donor Arron Banks, who had previously put himself forward to stand in the seat, tweeted: "Paul is a good chap, disappointing that the branch couldn't select their own candidate - it's the reason I didn't stand." Mr Bray, who represents Weeley and Little Clacton on Tendring Council, had initially decided not to compete for selection after the Huffington Post claimed he had posted controversial tweets. He then later changed his mind and stayed in the selection race, beating Mr Oakley. Former Clacton MP Douglas Carswell had been UKIP's only MP until he quit the party and later announced he would not stand for re-election. The BBC has approached London-based barrister Mr Oakley for comment. Mr Oakley will compete for the seat against Liberal Democrat David Grace, Labour's Natasha Osben, independent Caroline Shearer, Chris Southall from the Green Party and Conservative Giles Watling. Candidates have until Thursday to submit their nominations.